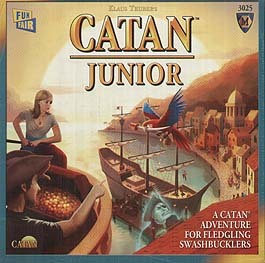 Catan: Junior lets younger players experience the world of Catan by introducing a simpler playing style. Designed for 2-4 plyaers a young as 6, it is a perfect introduction to the Catan series of games for kids and families. Catan: Junior takes place on a ring of tropical isles - including the mysterious Spooky Island, home of the Ghost Captain. Each island generates a specific resource: wood, goats, molasses, or cutlasses. You can also find gold. You start with 2 pirate lairs, and then build ships in order to expand your network. The more lairs you build, the more resources you may receive. Use your resources to build ships, lairs, or to get help from wise Coco the Parrot. You can even trade in the nearby market. Just watch out for the dreaded Ghost Captain! The first player to control 7 pirate lairs wins the game. Catan: Junior serves as the perfect introduction to The Settlers of Catan - the most acclaimed and honoured board game of our time. Available in over 30 languages, it's an international favourite. Kids 6+ can learn Catan: Junior in about 10-15 minutes and get playing right away. Averaging about 30 minutes, games are quick, and loads of fun. It's the perfect way to start exploring.